Christian Petzold’s post-Holocaust drama is based around a dubious premise: A German woman (Nina Hoss) emerges from the concentration camps with horrific facial scars, receives plastic surgery and rediscovers her husband in Berlin, where he fails to recognize her. Rather than revealing her identity, she allows him to believe she’s dead, only to wind up part of his scheme to have her pretend to be herself so he can claim her inheritance. But if “Phoenix” requires a certain suspension of disbelief to make its contained scenario work, the rewards of such a gamble speak for themselves. Petzold’s followup to the 2012 Hoss vehicle “Barbara” is a fascinating study of Holocaust trauma rendered in intimate terms. Among the trio of filmmakers known as “the Berlin School,” who emerged in the wake of the German reunification (along with Thomas Arlsan and Angela Schanelec), Petzold’s characters are typically alienated figures whose personal experiences represent the sense of dislocation associated with German identity. That’s certainly the case for Nelly, Hoss’ physically and emotionally damaged Jewish character in “Phoenix,” who wanders the bombed-out Berlin streets in a ghostlike state. Rescued by her friend Lene (Nina Kunzendorf), Nelly returns home to find that most of her family perished during the war. However, she discovers her husband Johnny (Ronald Zehrfield) toiling away in the city’s American district, working a dead-end service job at the titular cabaret club. While Lene urges her to leave the man along and join her for a new life in Palestine, Nelly commits to reconnecting with her husband and playing along with his desperate plan. Their drama unfolds with a noir-like elegance against the shadowy city streets, where Nelly comes upon the Phoenix club and creeps through its shadowy interiors. Much of the movie’s haunting qualities emerge from Hoss’ wide-eyed reactions to the demolished world around her, particularly her husband’s pathetic condition. Eking out a decrepit existence in a dank cellar, he forces her to remain there and “learn” how to behave like the woman he believes to be dead — insisting she imitate her own handwriting, come up with a backstory and wear her old clothing. Zehrfield — who last portrayed Hoss’ love interest in “Barbara” — plays his distraught character with an uneasy quality pitched between nervousness and outright frustration. Their scenes together form the bulk of the story, which unfolds with the mesmerizing focus of a grim chamber drama. Each exchange is steeped in fascinating ambiguity, as Johnny continues to insist that Nelly follows his orders. Petzold’s script drops subtle hints along the way that the man actually figures out Nelly’s identity and consciously blocks it out, a sophisticated form of denial at the root of the movie’s provocative themes. More than taking advantage of his wife’s death, Nelly realizes, Johnny may have betrayed her to the Nazis — but she lacks the ability to confront this possibility head-on. Her diminished condition takes on an abstract dimension that she only clarifies in a fleeting conversation with her friend. “I no longer exist,” she laments, adding, “I’m really jealous of me.” Bearing witness to a world that has moved on without her, she epitomizes the identity crisis of Holocaust survivors in the immediate aftermath of the war. There are moments where Petzold draws out her situation a little too bluntly, particularly one scene where the character offers a tearful account of her concentration camp experiences, but the occasional screenplay flaws come second to the performances that elevate its significance. Hoss’ portrayal of a woman at odds with her surroundings is in a class by itself. 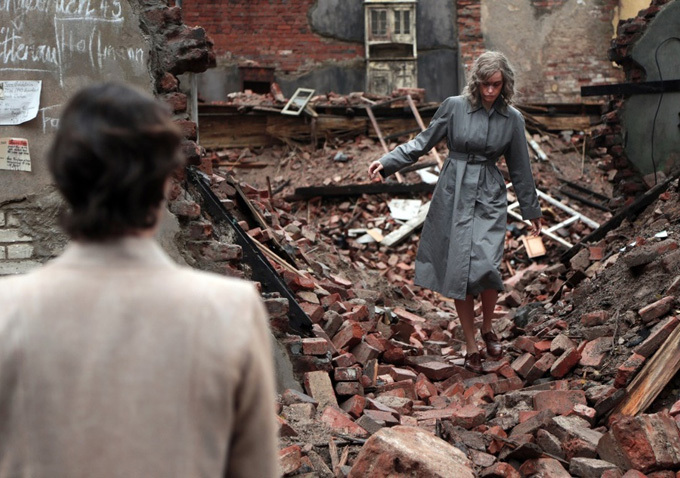 Similar to last year’s “Ida,” in which a young nun discovers she’s Jewish and explores her family’s past in war-torn Poland, “Phoenix” hovers in a dreamlike plane between the dark past and uncertain present. In its remarkable final act, the multiple levels of performance merge with fascinating economy, with Johnny directing Nelly’s behavior even as she develops confidence in her ability to wrestle control of the situation. Hoss’ final scene involves a masterfully enacted revelation that’s particularly notable for its precision: one tender song and a telling image say much about the desire to ignore the obvious at the root of the movie’s dramatic hook. 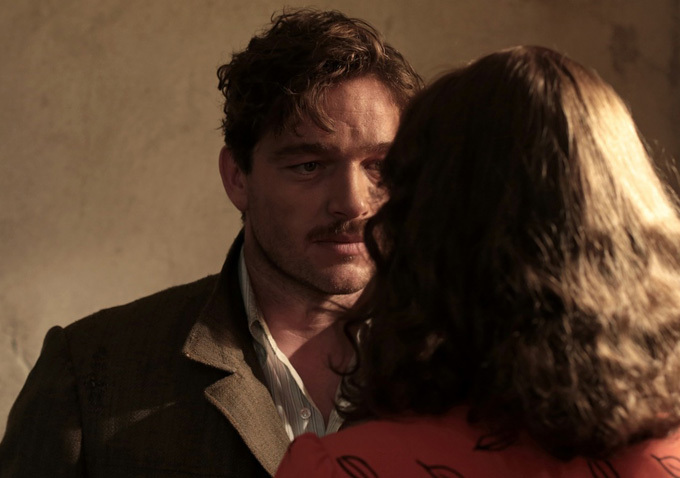 While Petzold’s “Barbara” featured a more complex set of events steeped in the paranoia of eighties-era East Berlin, the basic scenario in “Phoenix” gives the new movie a greater degree eloquence about its topic. As the final shot makes clear, history may fade, but its scars still resonate. “Phoenix” opens in the U.S. this week in limited release.